32 groups responded by March 1, from Metro Vancouver, Victoria and the Okanagan. This data as well as a beta website was presented to Minister Ciaran Cannon, Irish Minister of State for the Diaspora and International Development, who visited Vancouver on March 14/15. Response from Minister Cannon and the delegation was very positive and further feedback is expected in due course through the Irish Abroad Unit. The beta website is still under construction and will not be ready until later in the year. In the interim, the data from the responses as well as community group contact information are below. Please make sure to advise us if any of your contact information changes. Please share the survey to groups who have not registered. 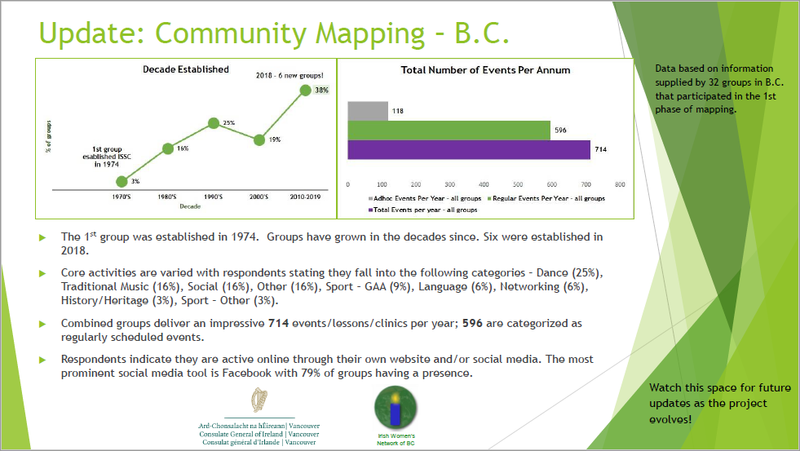 We are trying to reach groups across BC so if you know Irish groups or individuals in other parts of BC, please share the survey with them. Steel School of Irish Dance Inc.
Irish Benevolent Society of B.C.